What is the difference between “climate change” and “weather change”? Climate change can be found here, while a weather change or a change in the weather can be found by simply opening the door or looking out the window. This is what I experienced this morning when I looked out my window and what a weather change it was. For the last 3 or 4 days, the weather has been sunny, temperatures in the 20+C range, and the sky has been blue with nary a cloud to be seen for days. Imagine my disappointment when I looked out the window this morning. I could already hear the rain beating down on the roof. As I looked outside, the old me shuddered, it was raining cats and dogs, and definitely too much to go out for my daily power walk. The new me laughed and ridiculed the old me. The old me certainly wasn’t going to catch me with that trick again. Laughing from deep inside, I quickly dressed and stormed (pun intended) out the door. It was raining cats and dogs and they were BIG cats and dogs. I quickly set a good pace for myself and soon I was sliding my zippers down to ventilate my body. As my breathing got comfortable I realized that all the people that were on the road yesterday morning were not on the road this morning. Could the rain be keeping these strong healthy walkers, runners and cycle riders inside? … no, it couldn’t be … but YES, it was! My mind quickly flashed through pictures of when I was turned back from goals and events that I wanted to participate in. It was one day, long ago when I finally stopped limiting myself and my activities. I finally CRUSHED that little man inside me while reading Think and Grow Rich by Napolean Hill. What I was missing at the time wasn’t raingear, rainboots, or an umbrella. I was even worse off than that. 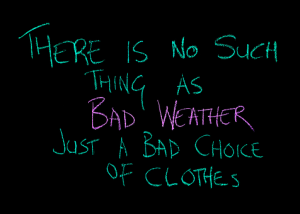 I had all the clothing I needed to weather the storm but … I had no persistence! Lucky for me that I had friends and one of these friends had a book called Think and Grow Rich. I began to read the book almost immediately and like millions of other readers I soon fell under Mr. Hill’s spell. His life and the research that he compiled in this little book has become an inspiration to countless numbers of people. In fact, very few educated people in the western world have not heard of this book. While reading the book, I came across a section titled, ” You Can Train Yourself To Be Persistent”. In this section, Napolean Hill goes on to say that persistence is a state of mind and therefore it can be cultivated. It is based on definite causes and he went on to state 8 of them. Here are 8 ways that you can train yourself to be more persistent. Knowing what you want is the most important step towards developing persistence. A powerful motive will be extremely helpful in overcoming obstacles. It is very easy to acquire and maintain persistence in pursuing an object of great desire. Belief in your ability to carry out a plan will encourage you to carry out your plan to its final conclusion. Organized plans encourage persistence. Having a plan to follow makes it so much easier to be persistent. Knowing that your plans are sound, based on observation and experience, will encourage persistence. Guessing instead of knowing will destroy persistence. Understanding and sympathy coupled with cooperation with others tend to develop persistence. The habit of concentrating your thoughts to build plans for attaining a definite purpose leads to persistence. Persistence is the result of habit. Your mind absorbs what you feed it on a daily basis. Take the time to measure yourself on these points and this analysis may lead to discoveries that will give you a new grip on yourself. It’s my hope that you too can learn this very valuable habit. The habit of PERSISTENCE. Persistence can be easily compared to weight training or any other sport or activity that you can imagine. Practice will make you better at it. The more you practice to be Persistent, the more persistent you will become and that will at the very least serve you well when you don’t feel very motivated to run, walk, or cycle on a rainy Monday morning! If you have any comments, questions, or suggestions about persistence or climate change please feel free to comment in the space below. What a wonderful post. I certainly share your ideals. I love the outdoors, hunting, fishing, camping, trapping, and hiking. I am in the process of teaching these skills to my oldest son and daughter. I am trying to get them away from the TV and into the wilderness. They are starting to become passionate with the outdoors now. Thanks, Mike, for reading my post. Your thoughts of passing on your love of the outdoors, to your children, is a noble one. Be creative and challenge them. Challenge them to build better fires than you can. Fires that produce less smoke. Teach them how to cook meats and fish over coals and not open flames. Let them bring in that fish on the line. Don’t YOU worry about losing the fish. Bring them to a gun range and teach them to how to shoot a bow. How to sharpen a knife and carry one as well. Get them books to read so they can show YOU new methods of starting a fire. Soon they will get the “bug” and you will have to hurry to keep up! Do this BEFORE they get swallowed by the electronic and social “monsters”. Hope this helps. Return with your stories and encourage them to comment on my website.